Many people can relate to the feeling of encountering the remnants of dinner leftovers the next morning and wishing one had saved at least the other half of the tiramisu from turning into anything but a culinary delight. But the feeling of disgust is more that that – it can be elicited by objects as diverse as milk gone bad and open sores, but also by the idea of deliberate deception and even by the pretentiousness of fellow poets. But how can one emotion have such a myriad of elicitors? What do they have in common? And what can evolution tell is about why disgust evolved the way it did? First of all, it is interesting that disgust is universal across cultures: People from around the globe exhibit the distinctive facial expression (which includes slightly narrowed brows, a curled upper lip, the wrinkling of the nose and visible protrusions of the tongue), body language (i.e., physical avoidance and withdrawal) and physiological response (i.e., reduced blood pressure, lowered heart-rate, decreased skin conductance, and decreased stomach muscle contractions) when feeling disgusted. Blind and deaf individuals have also been demonstrated to display both the typical disgust response and the ability to identify disgusted expressions in others. Therefore, disgust is considered a basic emotion. Despite the universality of the disgust response itself, there are also differences among individuals in how easily they are disgusted, for instance with women being more disgust sensitive than men, individuals scoring high on the personality trait neuroticism being more disgust sensitive and conservatives being more disgust sensitive than liberals (see this post for more details on neuropolitics, disgust sensitivity and what a brain area called insula has to do with it). Surprisingly, disgust expression and recognition has been shown to develop relatively late in ontogeny: Kids under the age of five to seven years of age seem not to be disgustable. It is however largely uncontroversial that social learning plays a major role in shaping disgust sensitivity, as research has revealed that (social) environmental factors are important in learning which objects or practices produce a disgust reaction. This also explains why disgust elicitors differ widely across cultures: Whereas some practices such as public kissing, eating insects, or polygamy are considered completely normal in some parts of the world, they elicit disgust reactions in others. Disgust elicitors differ widely across cultures. There are a number of evolutionary theories about the evolution of disgust, which propose that disgust solves certain kinds of adaptive problems. When a behavior is adaptive, it enhances the probability that the individual can reproduce. Repeated matter of discussion among evolutionary scientists is where disgust originally comes from, which other functions disgust fulfills, and whether disgust is biologically “pre-programmed” or a product of socialization. The most widely accepted theory about the origin of disgust is the so called Oral Origin Hypothesis. This hypothesis posits that disgust emerged from distaste, which is a ”toxin-based food-rejection system” serving as a protection of the body by avoiding pathogens. For instance, distaste motivates you to not eat the glowing red mushroom with the white dots after a quick lick left a bitter taste on your tongue. Crucially, distaste requires direct contact with the mouth and functions primarily as a means to prevent the oral ingestion of toxins. Distaste motivates us to not want to take a bite. Contrary to distaste, the emerged disgust system is a more general mechanism to avoid physical contact with potentially disease-causing organisms. The mechanism is basically acting as a behavioral immune system, which motivates behavior that avoids pathogenic substances. The consequences of ingesting contaminated food or coming in physical contact with microbes are very costly for individuals, and hence exert a high selection pressure for individuals to develop the capability to avoid these pathogenic sources. However, there is also a trade-off with regard to disgust sensitivity, as Jonathan Haidt nicely explains in his book The Righteous Mind: ”The emotion of disgust evolved initially to optimize responses to the omnivore’s dilemma. Individuals who had a properly calibrated sense of disgust were able to consume more calories than their overly disgustable cousins while consuming fewer dangerous microbes than their insufficiently disgustable cousins.”. There is some criticism of the Oral Origin Hypothesis from developmental psychologists. The main critique is that it is implausible that disgust evolved to avoid pathogens, because the individuals most vulnerable to pathogens (namely young children) do not seem to experience disgust. Moreover, it is questioned why social learning should be necessary for disgust, when there are a number of ”universal” sources of pathogens (e.g., bodily waste) found across all typical environments, which should be biologically prepared to trigger a disgust response. Nevertheless, disgust and distaste share much of their neural, behavioral, and physiological underpinnings, and the typical disgust response is functionally suited for keeping bad microbes from entering your body. Moreover, there is an obvious relationship between the elicitors of disgust and actual sources of disease threats. So this does provide ensuring evidence in favor of the Oral Origin Hypothesis. In an effort to explain the late onset of disgust acquisition, some evolutionary psychologists argue that there may not have been as much selection pressure for young children to develop a disgust system in ancestral environments, because they received nutrition exclusively from their mother and were likely carried for the first years of life. Another explanation is that it may have been necessary to reach other developmental stages (e.g., by acquiring certain cognitive abilities) in order to use social information to utilize disgust in a survival-promoting fashion. For instance, it may be necessary to employ culturally transmitted information for flexible usage of disgust, which should elicit a response to pathogenic cues (e.g., the poisonous mushroom) but not to non-pathogenic cues (e.g., the benign mushroom with similar features as its poisonous cousin). What is the origin of disgust? A third consideration is that disgust may well be innate although it is not present from birth on: Similarly as teeth, beards or the language faculty emerge later in life, the disgust system may also be acquired once a certain developmental stage is reached, possibly in interaction with socialization. This issue is still a matter of debate and requires further research, perhaps employing neuroimaging techniques (e.g., magnetoencephalography for toddlers) to find neurodevelopmental evidence of disgust development in children. Although the origin of disgust as a strategy to avoid disease-causing organisms is largely uncontroversial, there is less consensus on the function of multiple other domains of disgust which are unrelated to pathogen avoidance, such as the disgust of contact with mates that have low sexual value. The most agreed upon conception is that the different domains of disgust evolved by means of co-option or modification of the original pathogen disgust response, but how precisely this modification has come about is still unclear. Evolutionary scientists have however constructed categorization systems in order to explore the evolutionary function of different disgust domains. Thereby notions of different types of disgust were established, such as “core disgust” with the adaptive function to protect the body and “sexual disgust” with the function of avoiding sexual mates with potentially low fitness. But what about the undeniable feeling of disgust I experience when seeing Scar betray Mufasa in the Lion King? 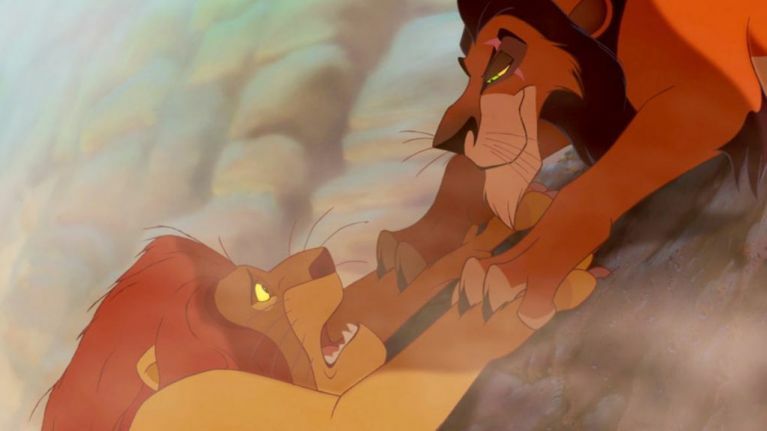 Why do I feel like I contemn Scar for his actions? This type of disgust has been fervently discussed in the scientific literature, and is called moral disgust. It refers to avoidance in response to moral transgressions such as the harming of a person, or deliberate deception. Opposed to other types of disgust, moral disgust is met with far more scepticism and controversy regarding its measurement, function, and even existence. The adaptive problem to be solved by moral disgust is argued to be the signaling to others that the action or person performing the action is condemned, thus enforcing social rules that are agreed upon within a community and protecting social order. Betrayal can elicit a moral disgust response. The consequences of disgust are social avoidance, and the need for social distance. For this reason moral disgust may also be a cause for exclusion and dehumanization of individuals deemed disgusting. Additionally, there is an intricate relationship between moral disgust and pathogen disgust: People with a high pathogen disgust sensitivity are also prone to high moral disgust sensitivity. Likewise, when people smell a disgusting odor they tend to make more harsh moral judgments, which demonstrates that the mere feeling of pathogen disgust may cause you to judge others more strictly. Disgust is one of the most versatile and multi-faceted basic emotions – it can even be elicited by witnessing the betrayal of a Lion King character! Since there is a tight link between oral and moral disgust, understanding the mechanisms of disgust and its adaptive value has crucial consequences for comprehending a myriad of processes as diverse as inter-group dissent about the appropriateness of certain social practices, a society’s particular food aversions, and even political disputes. Next Next post: Imitation in Infants: Innate or Learned?